It’s Minki Kim, and you can find me at Instagram @zeriano and MinkiKim.com. I also design fabric for Riley Blake Designs and I have my own line of sewing patterns. Do you like ginghams like me? You can create your own gingham pattern with only three or four contrasting print strips. Here are the examples of combinations and how I made them. I have made 5 placemats for everybody in my family and I am willing to make more for guests. It’s such a quick and fun project and a good way to use up your left-over strips! Finished size is approximately 13 1/2″ wide x 10 1/2″ tall. I used my Someday fabric collection for Riley Blake Designs. 1. To make a strip set A, pair one light color strip and one coordinating strip with right sides facing and raw edges aligned. Machine stitch with 1/4” seam. 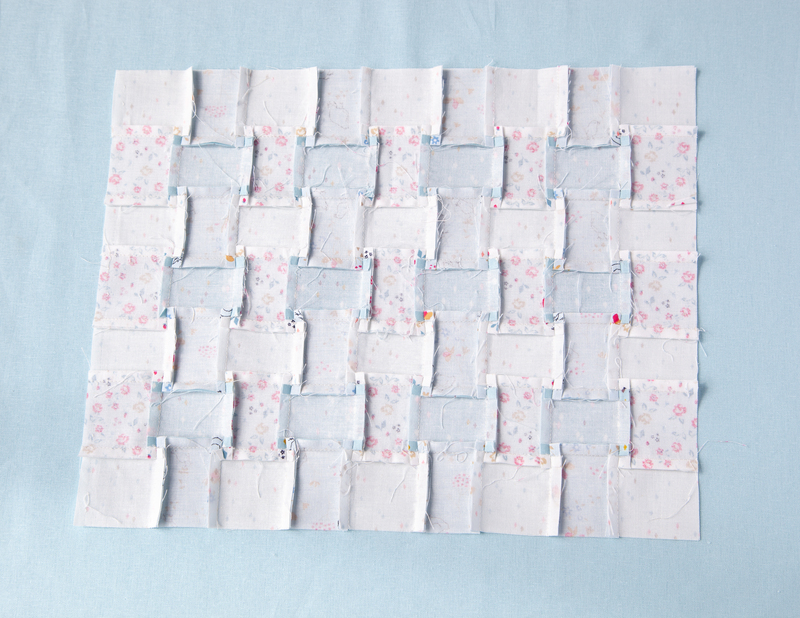 To press seam to one side, begin by pressing strips flat to set stitching. 2. Fold top fabric strip back, revealing right side of seam and strip set. Gently, press seam open on right side with seam allowances to light color side. Strip set should be straight, without any distortion along outside edges. Press from the wrong side to help set seams. Add third strip and press as said above. Join strips in pairs and then sew pairs together. 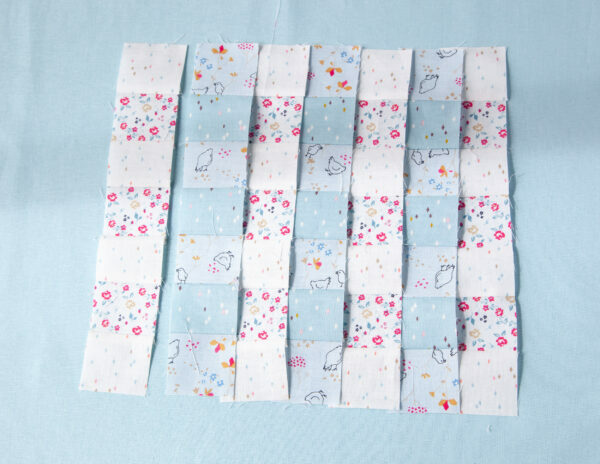 Sew a total of 7 strips together. 3. 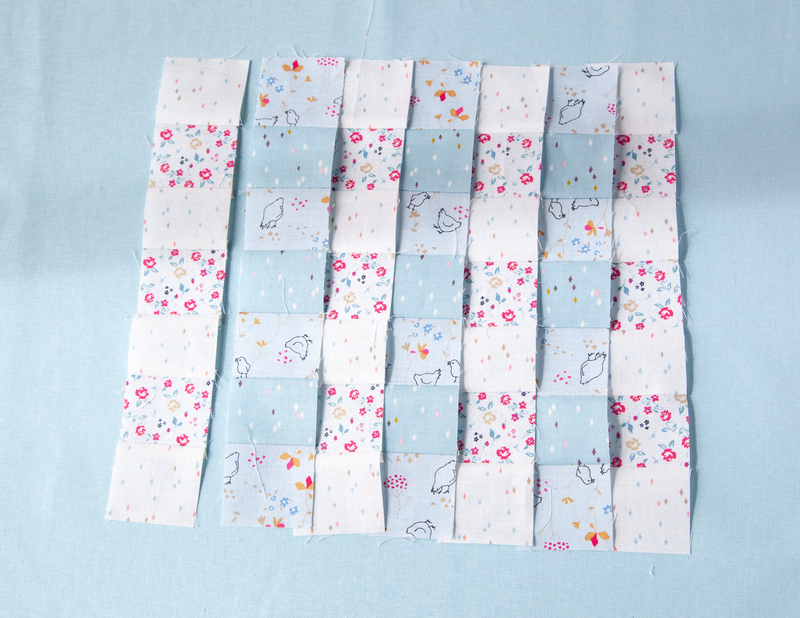 Sew accent strip and the remain coordinating strip together. Repeat step 1 – 2 for strip set B. Press seams to accent color side. 4. 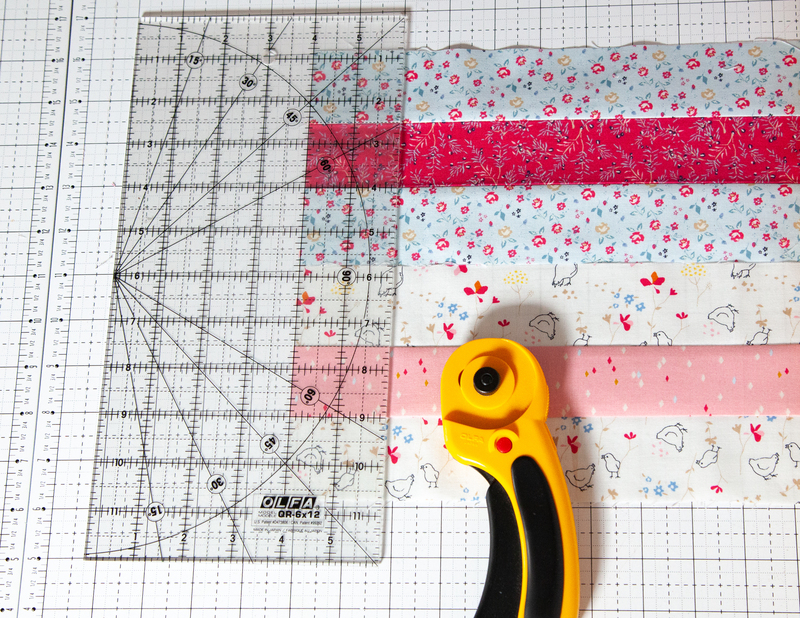 Aligning horizontal lines on a ruler with long edge and seam lines of strip set, trim the uneven end of strip set. Keeping horizontal lines on ruler aligned with a strip set, cut 2” width segments. *In this picture, I sew 3 strips first and then sew the remain strip sets. 5. Arrange strip set A and strips B as below. 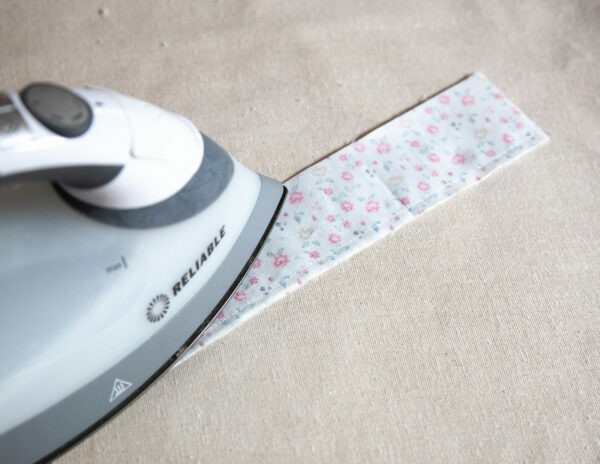 Make sure the seams are pressed in the opposite direction. 6. Join them together, aligning raw edges, press the seams as below. Trim the excess. It should measure 14” x 11”. 7. Fuse interfacing on the wrong side of the backing fabric. Right sides facing, sew backing together with placemat front, leaving a gap for turning right side out. 8. Turn right side out through the gap, and hand stitch the gap closed. Press in shape. Topstitch twice spacing 1/8” apart along outer edge. Someday collect has arrived at shops near you! Ask your local quilt shop or online stores. One lucky WeAllSew reader will win a Fat Quarter bundle of my Someday collection for Riley Blake Designs! The the giveaway is open through Monday, March 25th. The giveaway is open to residents of the 50 United States and the District of Columbia. One comment per fan. Comment must be submitted to the WeAllSew.com blog by Monday, March 25, 2019 at 11:59 PM Central Time. Winner will be chosen randomly. Winner will be notified by email and will have 48 hours to contact to claim the prize. 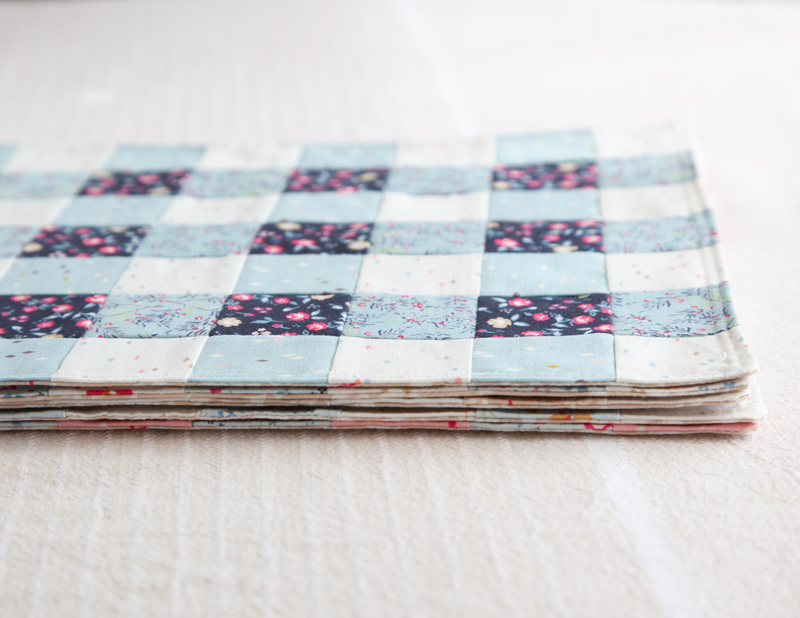 Previous Previous post: WeAllSew National Quilting Day Challenge! My favorite handmade gift was a Christmas tree ornament made by my son. My all-time favorite was a dress made by my mother when I was 17 years old and wore it on a special date with my boyfriend (now husband). It was a beautiful dress of fabulous material that I am sure was expensive–not easy on the budget. My all time favorite gift is a hand carved small Möbius strip. Can just daydream how my friend’s husband carved it out of one piece of wood. Handmade is the best cuz it bursts from the soul. Hard to pick just one. I have afghans and sweaters knit by my late mother and handmade wreaths and a shell candle holder made by a longtime BFF. These made me think “spring”! I love making placemats for our table, we use them all the time. Quilt shop here I come. Oops, forgot to answer the question. Well the favorite handmade item I have received has to be the queen sized Irish Chain quilt pieced and hand quilted by my mother. Bowl coozies we’re super gifts. Such a cute and easy project! I have a couple of handmade bed quilts I treasure. They were gifted to me by my mother, and were originally a gift to my grandparents when they got married. They are over 100 years old! This would be so amazing, oh my gosh!!! My favorite handmade gift is the crocheted pansy doily my mom made for me. 2nd is the first quilt I received from my mother in law. All made with love and so cherished! My favorite handmade gift was a dotted Swiss dress my grandmother made me when I was about four. It was a soft peachy/pink and held up so well that my own daughters wore it, too! That says a lot because I was 40 when my last daughter was born! My favorite handmade gift was an afghan that my mother had made back in 1940 for her mother. When my grandmother passed is was given to me. As a child, I always loved it and that made it extra special. My mother hand embroider ed my monogram on 2 pillowcases. My favorite gift was a handmade card from my son. I still have it! Absolutely love these place mats! I have two favorite handmade gifts – as a baby: a crocheted bear from my great-grandmother, and, as an adult: a wall hanging from my best friend. My favorite handmade gift to receive was a ceramic bowl my friend made as she learned to throw pottery on a wheel. My favorite handmade gift was a Christmas ornament made by one of my kids. Of all the gifts I have received from my boys while growing up, I think my favorite was a mother’s day card I received when my twins were in kindergarten. The teacher asked the kids questions and wrote down their responses. According to them, I liked to cook and vacuum. I was 10 ft tall. I still have almost every card, art class pottery piece and Christmas ornament that I was given to me. I received some homemade embroidered kitchen towels two years ago from my momma, and I get a little spark of joy every time I use them! They have cute sayings like “Bakers Gonna Bake” on them. Great idea for using for making placemats. 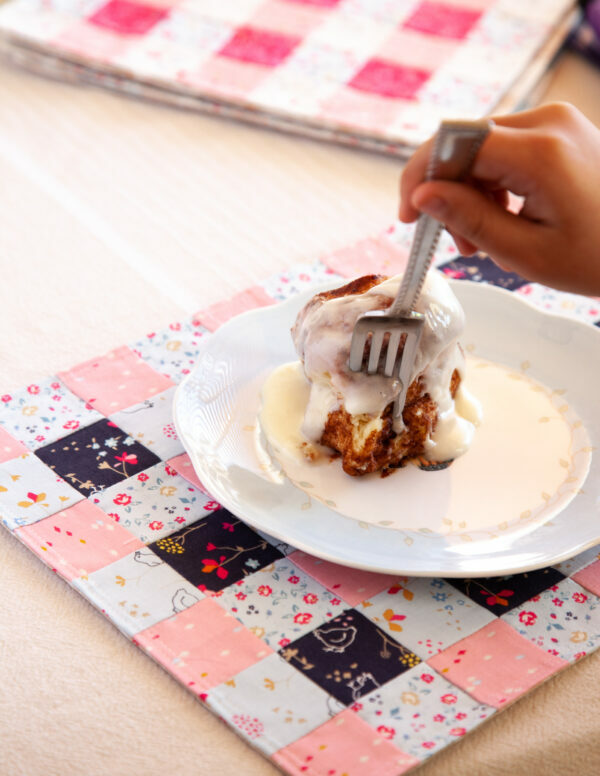 They make a great gift and I can always use new placemats. My favorite gift was a Christmas table runner my Mom made for me. A beautiful and cherished gift. this is apt. my favorite handmade gift is / was a set of quilted placemats, made by my sister who passed a couple of months ago. she made them for me for Christmas, log cabin pattern in all holiday prints. I treasure them. First I want to say that when I saw your placemats, it inspired me to make a pair and a matching table runner for my aunt’s 85th birthday. I was guessing on the measurements but came close and seeing your instructions, it is clear how you sew the different fabric strips together (I wasn’t too far off). My favourite handmade gift were the ones my children made! I LOVE the fabric line. My favorite gift that I have ever received was quilts made by my Great-grandmother’s. Even though they are gone, I know how much love they put into each of those quilts. I guess That’s where my love for reproduction fabrics comes from. Like many of the others who commented, my favorite handmade gift was made by my mother. She taught me to sew and set a very good example for me by sewing many of my clothes from the time I was a small child till I was nearly grown. My favorite is still in my closet after all these years, too. My favorite handmade gift is a crewel work picture my mother made. It’s beautiful and well done. These placemats are sweet, and I love patchwork. The best handmade gift I ever received was the wool skirt suit my grandmother made for me. The grandchildren have made several wonderful gifts but my favorite might be a wooden cutout of the USA with crisscrossed threads connecting a heart in their state with a heart in our state. I am lucky to have received more than one “favorite” handmade gift, but I’ll choose the hand pieced quilts from each of my grandmothers. One very refined and one very utilitarian and both completely priceless to me. My favorite homemade gift is a quilt made by my mother and hand quilted by my sister-in-law’s mother. This was a tough question though as I love and cherish all gift I receive that the giver has given a part of their soul in the making. My favorite handmade gifts were the 30’s quilts made by both my husband’s grandmothers. Some are very fragile but some have held up very well over the years. Without a doubt, my favorite and most loved hand-made gift was the Celtic knot quilt my Mother made for me! It was so pretty, she did it in lavenders and purples, some greens, gold.. I STILL have it, but it’s so worn out, I don’t dare use it anymore. But I still like to look at it and remember her. My mother-in-law sewed a yellow dress for me just after I married her son. It was special and magical all at the same time. My Mom gave me a quilt for Christmas one year. After it wore out I used pieces to make little wallhangings for myself and my sisters. I love my “sew together bag” by Sew Demented. I can put many every day sewing tools needed and great for travel..
My favorite handmade gift is a beautiful quilted Christmas tree skirt. It was given to me by a dear friend many years ago. It gets used every year. I don’t know if I have a favorite, I always liked handmade gifts received from relatives. My grandmother gifted me a quilt that I treasure, growing up I received beautiful hand made doll clothes from my other grandmother, and also from my mom. 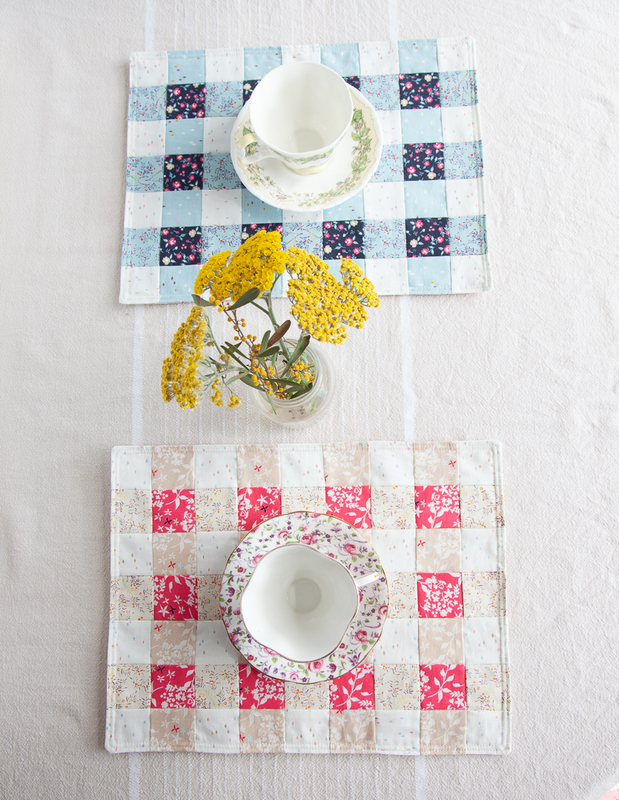 Love the gingham placemats! My favorite handmade gift is a Afghan knitted by my sister. My favorite handmade gift is an appliqued basket quilt that my mother started before she married. It is a treasure since my mother passed away a few years ago at the age of 97. I will gift it to my daughter as a remembrance of a very talented, inquisitive grandmother who loved handwork. My favorite handmade item that I received as a gift is an organizer for my sewing accessories, sewn and quilted by my daughter. I have some tiny crocheted baby doll clothes made by my grandmother more than 60 years ago that bring back precious memories. My mother-in-law had her mother’s hand-stitched, state flower quilt blocks quilted together and gave it to me one year for Christmas. The Chattanooga Times, I believe, would publish a state flower each month to quilt and her mother stitched each flower. My mother-in-law took the blocks and had them finished into a beautiful quilt. She has since passed away, too, and it’s a treasured gift that will be passed on to our granddaughters. Love this pattern. I have been making pot holders and table runners out of small squares. The best handmade gift that I have received is a quilt that my grandmother pieced and my great-aunt quilted. The gift was a wedding present. My favorite homemade gift were some ceramic pieces that my daughter .made. My mother-in-law made all her children and grandchildren afghans. Treasures. I love and still use an afghan crocheted by an aunt. I have a set of mini quilts for the seasons that a friend made for me that I just love and use all year long! A cute hedgehog pot holder that my daughter made for me. It’s hanging next to my cook top as it’s too cute to use. My favorite handmade gift that was given to me is a nut bowl made by my son. It is welded nuts (like nuts and bolts) shaped into a bowl and painted black. Very heavy too. I have never thought about making “gingham” this way! My favorite handmade gift is a set of lacy hearts made by my sister-in-law, Jan.
My favorite thing was wonderful in every way. After six years of trying to get pregnant , my daughter found out she was having a baby boy and a baby girl.My daughter had called me at work. My employee witnessed me when I found out I was going to be a grandmother. A month later the same employee handed me a beautiful quilt she had made with embroidery quote as to what I said when I found out I was going to be a grandmother of twins. My favorite handmade gift was a sweater my Mom knitted for me when I was young, we were poor and she wanted to do as much as she could for me to have new clothes. My favorite handmade gift is an afghan my mother made. My favorite handmade gift I received was a beautiful white chiffon dress with little flowers printed on it and a yellow and white cape that one of my aunts made me when I was a little girl. She also made me a light blue wool dress with matching little bag and short jacket. They were all impeccably sewn and I remember every detail to this day, 50 years later! Love the gingham, I’ve made several in baby size. The favorite item I cherish is a handmade quilt given to me by my mother-in-law when I married. It was made by her mother and it still looks good, probably made in the 1930s! Gingham placemats are on my to-do list for Xmas gifts. My favorite handmade gift is an afghan knitted for me by my husband’s grandmother. Like the Someday collection. My favorite homemade gift is a knitted scarf my Mom made gor me! My most favorite handmade gift is a table runner from my daughter. She began learning to sew on her own at age 38 (she never wanted to sew before then) and she made the table runner for my birthday – I treasure this gift. My favorite handmade gift is a pink baby blanket made by my grandmother for me I believe some of the floral print fabric is from flour sacks. When I was about 10 years old, my mom was bed-ridden due to an illness. With 8 kids at home, she still managed to create Christmas gifts for all of us. She hand-sewed pajamas for us younger ones with the help of a neighbor lady who cut out the fabric pieces. Every seam was double stitched and even the button holes were cleverly hand-stitched! I wore those jammies for a very long time and they withstood many launderings! My sister made us a queen size bed quilt for Christmas a few years ago. We love it. So hard to choose between the champagne orange marmalade, the pomegranate jelly and the apron my grandmother made for me at age 6. The apron wins- I got to help sew on the machine. I’m not sure I lived up to expectations in the kitchen but I sure loved sewing on that old machine. Still do. My favorite handmade gift is a traditional Korean blanket made by my mother. She says that it is reminiscent of the blankets she used during her childhood. My favorite handmade gift is a revolving wooden rack that my DHmade for my rulers, cutters, thread, templates; anything that can be hung. It takes up 1 square foot of floor space and everything fits! Love the gingham placemats and can’t wait to make some! My favorite handmade gift is a knitted pin cushion given to me by my 80 year old neighbor 55 years ago. She waited for me on her front step to come home from school when I was in the 6th grade. It is my favorite pin cushion and I continue to use it today. My favorite handmade gift wasn’t one I received but one I made for my two younger sisters. It was Christmas 1963 and our family was going through an extremely hard time financially. In other words, there was no money for Christmas present. I was 16 years old and my younger sisters were 7 and 9. I didn’t want them to be disappointed Christmas morning when they woke up and found nothing under the Christmas tree. I spent all of Christmas Eve making clothes for their Barbie dolls. Fortunately, we had a nice stash of left over fabric, ribbon, and lace from previous sewing projects. I was able to make several outfits for each of their dolls, wrap said items and place them under the tree before they woke Christmas morning. I’ll never forget how delighted they were to find these small hand made gifts under the tree Christmas morning. To this day, they have no idea that I was their “Santa” that year. My favorite was a personalized baby blanket for my son! I have an afghan on the back of my couch a friend made me that I love. I have a question for you. I burnt out another iron. We made pillowcases for Children’s Hospital, 196 total and by the time I washed and ironed all of them I had a dead iron. Do you like the Reliable iron? I need one that is not too heavy. Bad wrists. It would have to be a coat my grandmother made for me from a coat of hers. My mother made me a double wedding ring quilt for my wedding. I will cherish it forever! A handmade pincushion that my elderly aunt made for me when I was a teenager. I still use it, many years later. She helped instill my love of sewing. My mother in law covered a photo album with material, padding, lace and a front picture insert. I use it as my wedding album. OMG how do I pick from so many wonderful handmade gifts from my mother, grandmother and sisters??? I loved them all. Two years ago my husband made three homemade signs each with the outline of the state or country of birth for each of us. He painted red hearts to mark the city where we were born. They’re so special. My favorite gift was a little, dirty (tea-stained) angel with a curlicue wire that had a star attached. It was made by my BFF and used to decorate a Christmas present years ago. I hangs in my kitchen because I love it so! I think it may have supposed to have been a tree ornament but I didn’t want to put it away. I still have some of the hand knit sweaters that a friend of my mother knit for me over 40 years ago. They are all done in the same classic pattern . Love the spring look of these placemats. 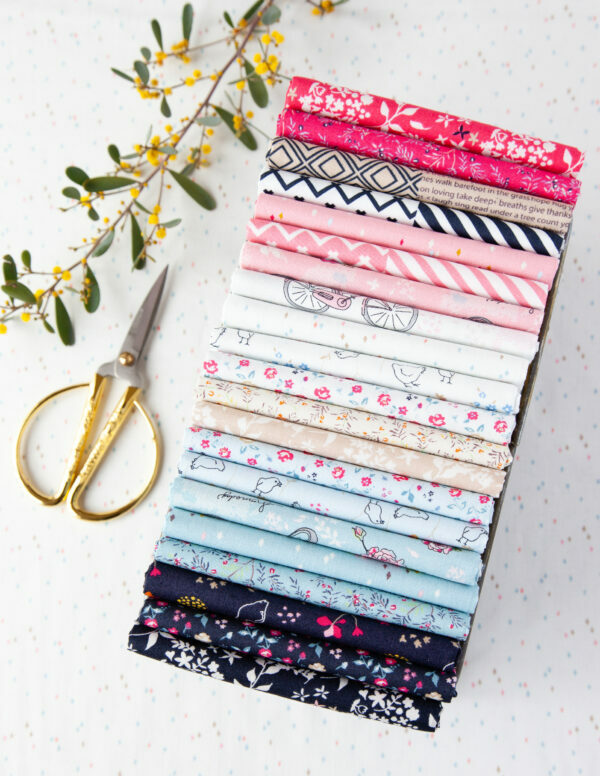 Upbeat fabric collection would be a breath of spring as we suffer through a very tough winter. First Communion Dress made by my aunt. I had a friend make a cute little pin cushion hats perfect for traveling projects. My most favorite handmade gift was given to me by my Mom! 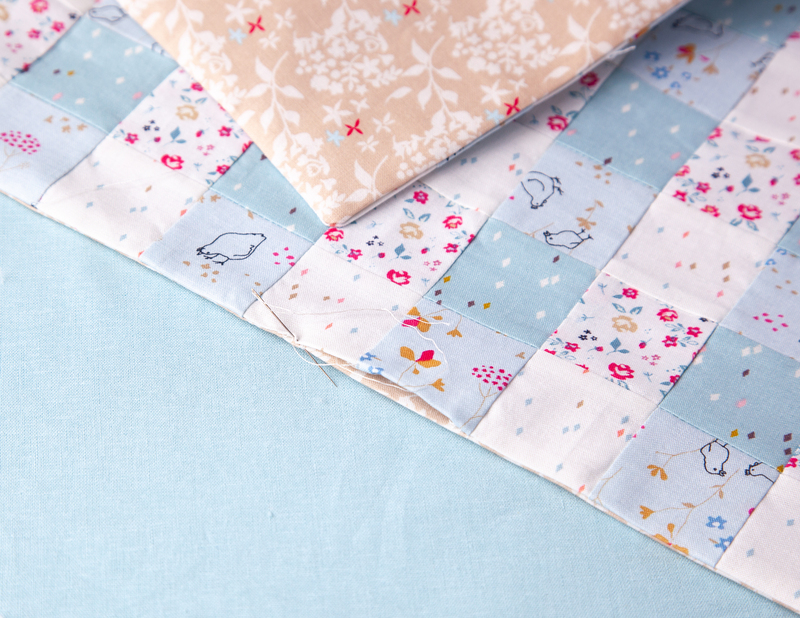 It is a beautiful queen sized quilt in many shades of pink, green and blue that is a trip around the world pattern. The back is also pieced with applique flowers (irises!) and is just beautiful on both sides! She made this for me many years ago on her Bernina 1130 and you can see how much love she put into every stitch! My favorite handmade gift is a beautiful intricately paper pieced heart I received in a swap! It’s a mug rug so I get to enjoy it daily with coffee and tea! This fabric is so gorgeous! Thank You for the opportunity to win some. My grandmother knitted a wool sweater coat for me. I still have it all these years later. My husband’s grandmother’s quilts. They were made in the 1940s and I restored them as a Christmas present to him one year. They are the most precious and beautiful works of art we own. My favorite handmade gift is lid potholders. They are small and you can get a hold of the pot lids real easy. And my second favor things is mug rugs. Since I received my first mug rug as a gift, I have been making them for some of my friends. My great aunt made a baby quilt for my first born. I still have it and that baby is 21 now. My son and his wife made me a plaque with scrabble letters with all my children’s names. Which is a LOT! A cross stitch birth announcement when my daughter was born stitched by a co-worker!! My mother made our “first day of school” outfits every year. She also made most of the rest of our clothes. One of my favorites was a ski jacket with zipper pockets and a place for everything – including the wax we needed to put on our skis back in the late ‘50s! My great Grandmother crocheted a TEENY dress on tiny plastic doll so I would never be alone.She is no larger than a 25 cent piece. I am now 80 and it’s still cherished. A quilt my grandma sewed and gave to me when I got married. A beautiful hand-crocheted poncho. My mom and I bought the yarn for it, and we went to Hobby Lobby like three times a day for a month so we could use a 40% off coupon on every skein. Then, we mailed it to my mom’s friend, who selflessly gave her time and skill to crochet it. I remember all those trips to the store with my mom, and I remember receiving it in the mail later and feeling wowed by the texture and how gorgeous it was. A small quilt made by a volunteer when I retired from Red Cross. For a wedding present, my mother’s friend painted a watercolor of a huge oak tree that was on our property. It tied both of us together, as it was planted by one of her ancestors who owned the property before my parents. I received a pin cushion from my sister that meant the world to me. She put a lot of work and much love into it. She passed away a little over a year ago and the pin cushion reminds me of her every time I see it. A great aunt used to spend Christmas with us and would make cute little tree ornaments for my brothers and myself. My mother grew up in the era when all good mothers knew how to sew but she never really liked it. That’s why it was such a big deal when she made me a stuffed hippopotamus out of the blue. It’s what I used for security at night when I was a little kid. My sister made me a fleece throw for my bed. It was the first time anyone has ever given me anything handmade. I love it. A handmade fleece throw. My sister made it for me. Love the fabrics. Need to make these. Have lots of scraps. My favorite handmade gift is a beautifully hand crocheted vest made for me by my sister. I picked the pattern but she did ALL the rest. I’m a quilter, admittedly favoring traditional styles. I love Riley Blake fabrics. They have have a sweet, whimsical, innocence to them. PS March 25th is my 30 year wedding anniversary! My favorite gift was a pin cushion made by my youngest daughter. My jewelry box—it was made out of locally grown ash and given to me by my husband. I see it multiple times every day and am reminded of how much I love him. My favorite handmade gift is an gingham apron made by my Grandmother. Years ago, I received a hooped embroidered Christmas ornament that is still precious to me!! A cabinet built by my then, gentleman friend, who is now my husband. The Raggedy Ann & Andy dolls my aunt made me. They’re now antiques! My all time favorite handmade gift I received was my son’s baby quilt made by my older sister. Made from gingham pre-quilted fabric from a custom sewing job she did for someone else along with polyester double knit for backing, the twin sized quilt was great for snuggling when he was small, made a great tent/blanket fort when he became adventurous, went with him from home to wherever he might roam as he grew older and was retrieved to be taken on his honeymoon. A bit thin of later years it has been retired to his closet but he still has it and I have all the memories of sharing special times with him and the quilt. My favorite handmade gifts have been the diaper bags my friends gave me to celebrate babies #3 and #4. Love these placemats! They are so pretty! My favorite homemade gifts have been the baby blankets my MIL made for each of our kids. sewed an apron using orange gingham fabric and hand sewn white cross stitches on the squares and I will always cherish it! My favorite handmade gift is an infinity scarf with ruffles that a friend created for my birthday three years ago. The colors are bright and happy which makes me remember the love that went into it. I will always treasure it and remember how loved I am. My best, most cherished gift I have is hand embroidered kitchen towels my Grandmother made. They have fruit and flowers on them. They are falling apart and I never use them, but I keep them in my kitchen drawer and just pull them out every so often to remember her, she’s been gone for over 20 years. I also have her first needlepoint project framed in my family room. She learned how to needlepoint in her late 60’s. She had lots of vision problems, so when you look at it, you can see all the mistakes-it just makes it all the better! The best handmade item I have received was an antique quilt that took 10 years to be quilted by a local church near us. The quilt top is over 100 years old and was made by my grandmother and my great grandmother. My mother was given the quilt top when she married and I received to quilt top when I married. I will be giving the quilt to my granddaughter when she marries. I love these Placemats. I plan to make a few for my house. Our other placemats are getting ragged!! My best gift was a bicycle in the attic when I was 12. I can’t pick one…my favorite handmade items are from my kids and grandkids. A wooden, painted bird recipe card holder, a wooden cutting board, a wooden, painted heart pin, a drawing of a rose, and homemade cards. They are all so precious to me. My favorite handmade gift I have received was a quilt made by my best friend for my 50 13/12th’s birthday. She was busy working so it took her a year and a month to get it done. The fabric shown would be so pretty sitting on my kitchen table to beautify my kitchen. My favorite handmade gift was a quilt I inherited from my grandmother. It was hand pieced and hand quilted by her mother…my great grandmother. It proudly hangs in my family room and I love it. 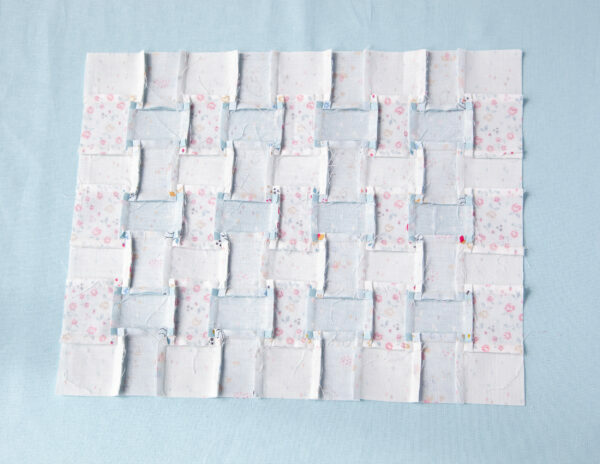 I have thought that one day I might make 2 smaller quilts in the same pattern and give one to each of my 2 daughters. It is simple, yet modern…timeless. My favorite gift is hard because I’ve received so many special ones. One was a cross stitched on burlap wall hanging. It was my first Christmas with my hubby family. She was a little child and the cross was crooked …. But the love was so huge! These placemats are exactly what I need. We are remodeling our old farmhouse kitchen. Thank you! My favorite and most used handmade gift is a crocheted afghan. A co-worker spent a lot of time making this beautiful gift to give me at my retirement party. I think of her each time I use it, which is a lot during cold weather. My cats 🐱 love 💕 it too 😻. A flannel quilt my daughter made for my dear friend and business partner. His health was failing and he was always cold. He told her it was hers when he left. She gave it to me and we keep it at her house. We snuggle under it when we watch movies or other times we need to keep warm! So comforting and good memories.. 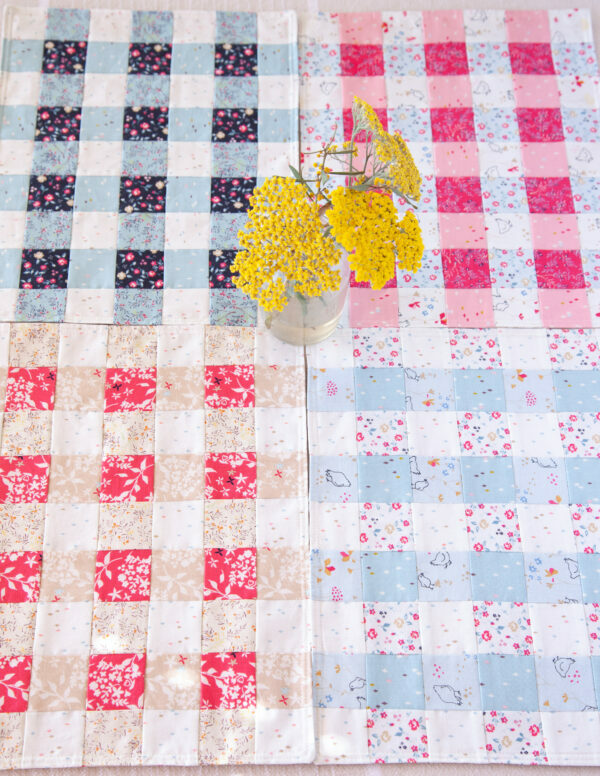 I can’t wait to make these gingham place mats and the Someday fabric collection by Riley Blake Designs is so adorable. My favorite handmade gift was made by my father. It’s a small wooden wheel barrow in my yard that I fill with colorful flowers every spring. He loves to make items from wood and he is 85 years young. So lucky to have him for my Dad. these will make great christmas presents and for different holdiays also. I am 76 years old and I taught myself how to quilt a couple of years ago. All of my seams may not be a perfect 1/4″ but they are getting closer and closer to perfection with each quilt top I complete. My children, grandchildren and great-grandchildren cherish their quilts that I’ve made for them just as I cherish MY MOST FAVORITE HAND MADE GIFT WHICH IS A QUILT MADE BY MY ELDERLY AUNT ALICE AROUND 1960 IN A SMALL CABIN ON THE SIDE OF A NC MOUNTAIN. IT IS TOTALLY HAND STITCHED AND MADE OUT OF EXCESS FABRIC ENDS AND PIECES FROM A NORTH CAROLINA FABRIC MILL. There is no rhyme nor reason to the color placement, but I’ll treasure this quilt until the day I die and will pass it on to one of my children who will cherish it for life. My favorite handmade gift is a nativity my daughter made in 4th grade. I love it! Thanks for thepattern! Cute placemats!! My favorite handmade gift was a blazer made by my mother when I was in high school. She even tried it on me without my figuring out what she was making-I was blindfolded and she put it on over my head like a dress. It was a forest green and coordinated nicely with a really loud pair of plaid pants. My favorite gift is a hand-embroidered tablecloth my mother made for our wedding. She got only 3 sides done, but I still use that linen tablecloth just the way it is! She had a perfect stitch and alignment — I always treasure the memories of her making this for us. My grandma made me homemade Christmas ornaments with styraphone balls, beads and ribbons. I treasure her gift and hang them every year on my tree. I was so blessed to have a Nana that showed me how to craft, sew and quilt. I love the placemats and fabric! Everything my kids made me when they were little is my favorite. My favorite handmade gift is a set of wooden spatulas beautifully crafted by a cousin. I have been using them for many years. It pleases me that they are both useful and lovely. A handmade photo album with all of my grandchildren’s pictures and art work from the year! I really like these place mats. I never before thought of replicating gingham as a quilting theme. Now my imagination runs wild! My mother made many handmade textile Christmas gifts for me. A favorite is hard to pick. It’s a toss-up between a heavy cotton tablecloth with her hand crocheted filet lace edging and the cloth dolls that she made me as a child. The best handmade gift I’ve received is a king-size bed quilt made by my favorite aunt for our wedding. She took paint swatches of ours, and took pictures of our decor and shopped for 2 years finding the perfect combination of batik fabrics. The quilt is awesome and I love it very much! When I first got married 50 yrs ago…my mother-in-law made me a red ultra suede blazer for Christmas. It was the most beautiful handmade gift I ever receive. She put so many hours in it …just for me ! She was a very lovely seamstress and taught me so much with my sewing. She taught me to enjoy every step of sewing process ! My favorites things were made by my mother who is 102 years old. She has make me many things but the favorite were the sets of doll clothes she made each year for me and my sisters. She still knits dish cloths and hot pads for me. My favorite gift is a quilt made by my quilt friendship group and given to me when I was ill.
My favorite handmade gift was from the mother. She made me a leather dress. My favorite handmade item was a quilt made by my grandmother that I kept in my hope chest until I got married. My favorite colors are lavender, purple, violets and pinks all of which were incorporated in the pieced tumbling block quilt. This talent was passed down to me. I watched my grandmother hand quilt many projects and it was my job to help her by threading her needles for her. My favorite is a hand carved Möbius strip out of one block of wood. Still can’t figure out how he made it. My favorite homemade gift I’ve ever received, other than gifts from my children, was the lap quilt I got for comfort during cancer treatments. It was beautiful, soft, and reminded me that I wasn’t alone in the fight. My favorite handmade gift was a knitted Afghan made by my mother. She also crocheted our last name which I hung on our wall. The beautiful quilt my sil made for me! My oldest niece made me a pink macrame’ owl almost 50 years ago. I still have it hanging in my sewing room. Brings me smiles everyday! My favorite handmade gift was from my high school friend on my first marriage, a crocheted afghan that has been much-used and loved.